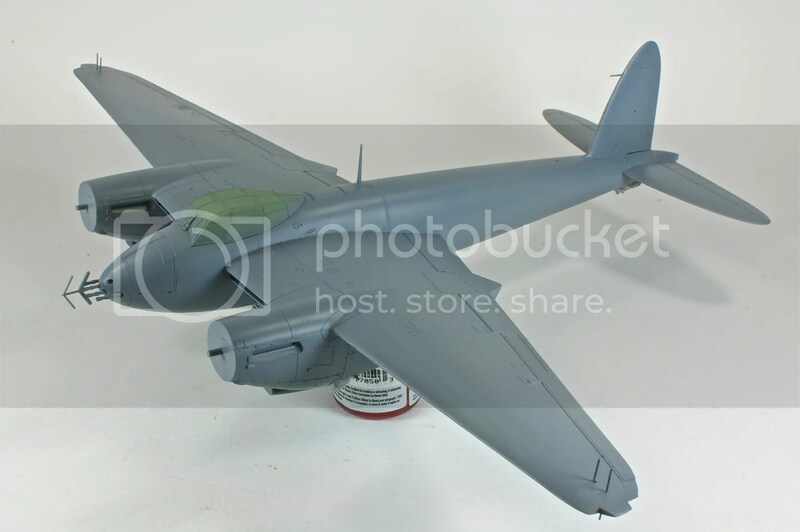 The Mosquito NF Mk.II has an interesting paint scheme history. When the wooden nightfighter first entered service, it wore the RAF’s RD2Ma nightfighter paint. 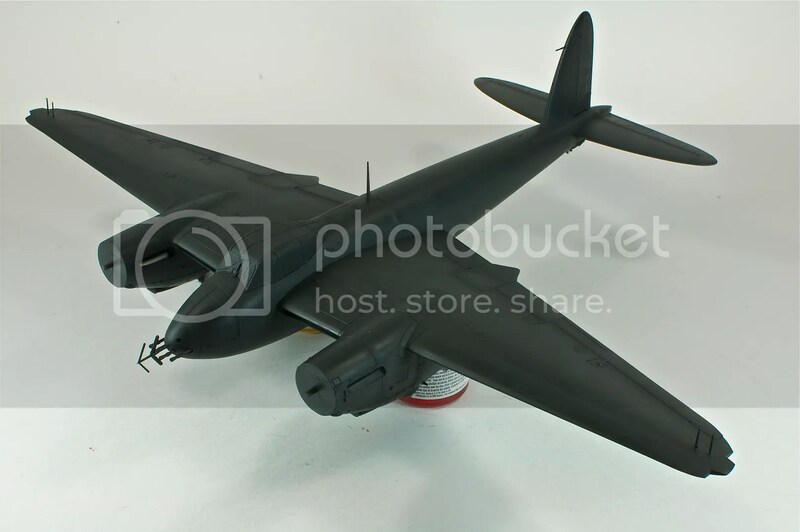 This rough, matte black finish was designed to conceal nightfighters in the night sky, but it was so rough that it had a negative impact on the Mosquito’s performance. It was soon discarded in favor of a smooth black, which restored the Mosquito’s stunning performance. Unfortunately, it also proved too visible to other aircraft, especially on clear nights. Before long, Mosquitos adopted a gray/green camoflage scheme on the upper surfaces, while retaining the smooth black paint on the undersides. This particular Mosquito, however, is being depicted in its smooth black paint. I’ve been going back and forth with primers for awhile. 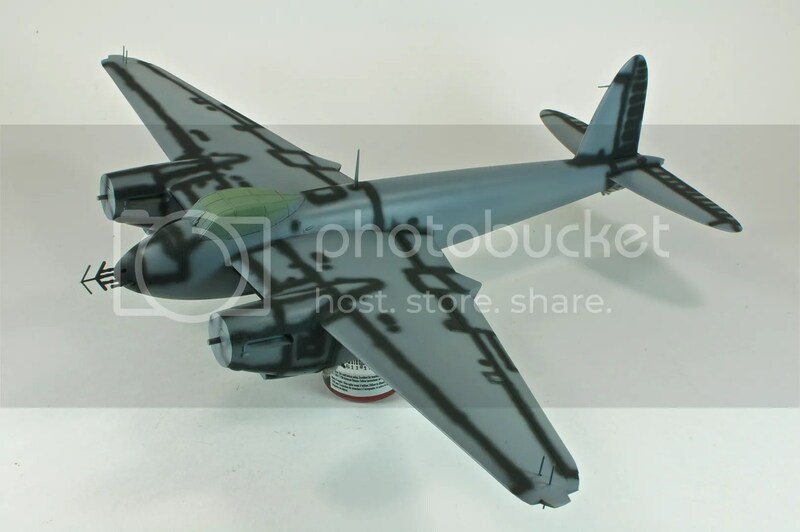 While I really like Mr. Surfacer 120o, I experienced some minor paint lift when I used it on my Bf 109E-7 build. The paint lifted all the way to the plastic, which is strange, since the lacquer primer is supposed to “bite” into the plastic a bit. Frustrated, I went back to my good old Model Master primer. Of the primers I’ve used, Model Master has always been the most consistent, and I have yet to experience any paint lift with it. As usual, it gave me a nice, smooth, even surface to work with. 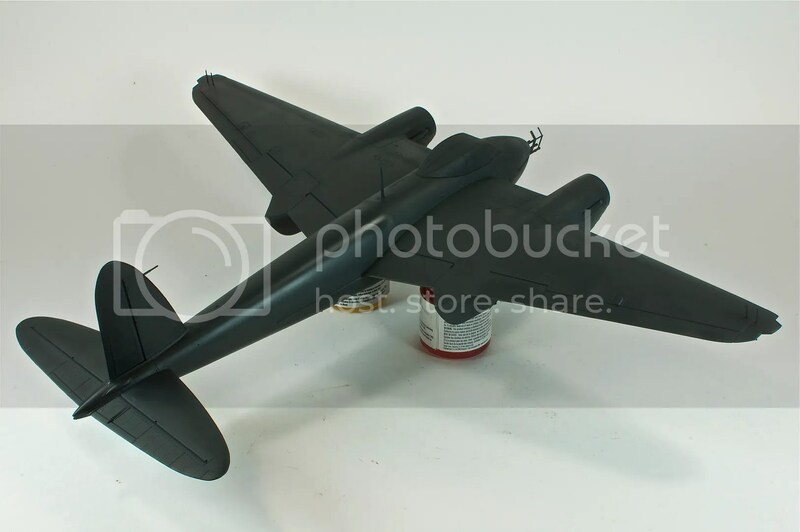 At first, painting an aircraft all black seems simple. And for the most part, it is. But going with just straight black is hazardous. It robs the surface of any depth or nuance and makes the model look, well, like a model. I decided to try to add some character by pre-shading the major panel lines with Model Master flat black enamel. At this point I have to stop and point out a drawback to the Grex Tritium TG airbrush. The pistol-grip trigger is awesome, but the careful modulation required to handle the pre-shading work did a number on my arm, and by the end of the night, I found I couldn’t grip the garage door with enough force to turn the knob. It reminded me of the way your thumb goes all useless after bowling. Once the pre-shading dried, I moved on to the black. Or rather, the almost black. The goal being some slight color variation and a sense of depth, I used a 3:1 mixture of Vallejo Model Color Black Grey to Black, thinned about 60% with Future. While I felt like I was battling tip dry and clogging issues more than normal, the paint went down well. Ah, the benefits of self-leveling Future! At this point, I just have to mask off the prop tips and paint the blades, and then it’s on to decals.